Convert Excel spreadsheets to online calculators for web pages! Everybody liked the car loan calculator I did in Excel. With just a few clicks I could share it on my blog as a calculating web page. Anything I can do in Excel, I can share on my blog. She can benefit from my work anywhere. All she needs is a web browser. So she comes back. I turn Excel spreadsheets into live web calculators that help my customers and prospects reach their goals. The more tools I put up on my website, the more visitors I get. Try a few of our examples. I can give him an instant quote for 200 customized rubber tubes right here in the coffee shop. 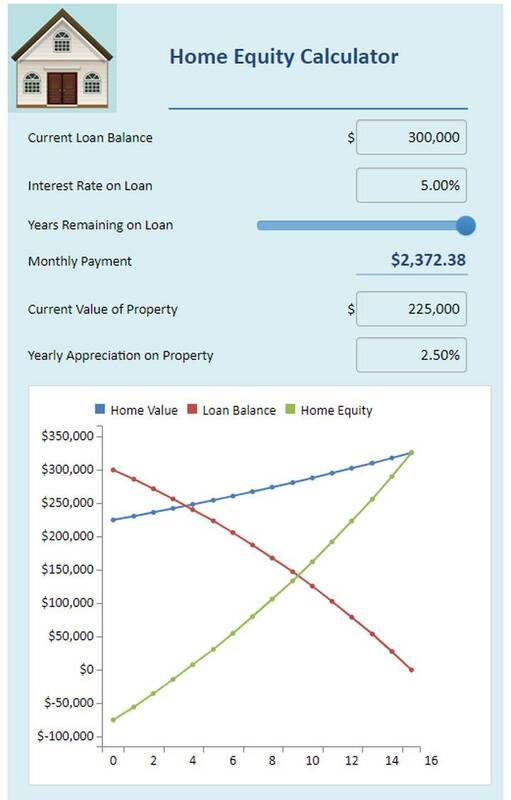 If you change anything in the home loan calculator on my blog, the live chart is automatically updated. 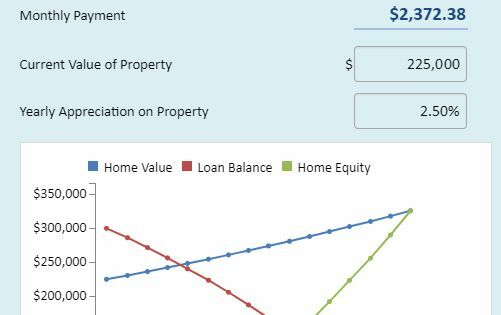 See a live chart example. I used a spreadsheet to handle catering for meetings. This magic add-in for Excel converted it to a smart web form that anybody could use. 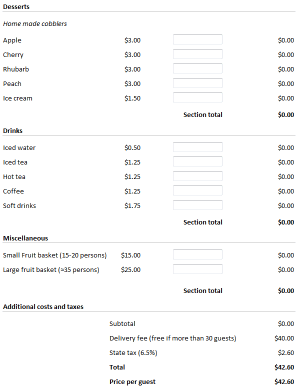 I added a Send button to my catering form, so now I get all the catering orders directly in my Inbox. All from an ordinary Excel spreadsheet! This Excel add-in converts spreadsheets to live web pages. You get a lifetime license with no charge per month or page, and an unconditional money-back guarantee. 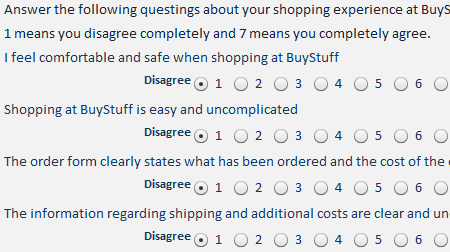 I can automatically collect thousands of survey responses in a cloud database. No programming – only Excel – it’s so simple! Take the web shop survey. Convert Excel spreadsheets to live web pages! Convert Excel spreadsheets to calculating web pages. With this powerful add-in for Excel, you can convert spreadsheets to modern web pages with functionality that would be very costly to develop with the help of a professional web designer. Help your users buy the right volume of seeds for their garden, select the best printer or order 200 customize rubber tubes. Create smart web forms. Design the perfect mobile data entry form in Excel with calculated totals, weights, and volumes. SpreadsheetConverter appears as an extra menu in Excel where you can add graphical widgets and other important form elements to your design. 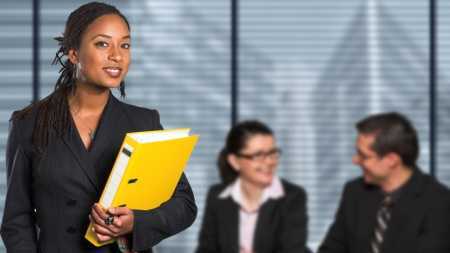 Receive submitted forms via e-mail or in a cloud database. Compile any Excel spreadsheet into a powerful web app. Help a building engineer complete a safety survey directly on-site. Calculate your server’s power and cooling figures on your iPhone while your customer gets her car. The Calendar widget follows regional settings and allows you to use formulas to calculate a more exact default date. Format printed output better with a separate, hidden Print Sheet. 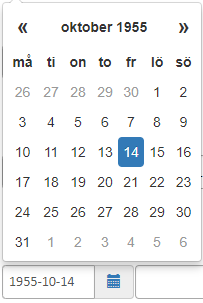 A date field can be set to be a Required field. 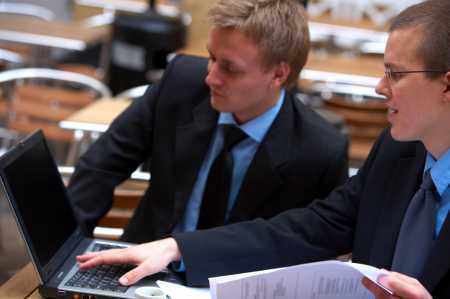 When a user prints an advanced web form, the Print Sheet enables you to assemble all the required information on just one page, and format this page for printing. Increase your productivity with automatic conversions. Live Preview windows are always in sync with what you do in Excel. Version 10 also has a new ribbon layout with smart shortcuts to tabs and windows. You can open Live Preview windows on any device on the network. You can copy and paste widgets. If you need to insert many widgets of the same kind, there are now two ways to do this with just one click. 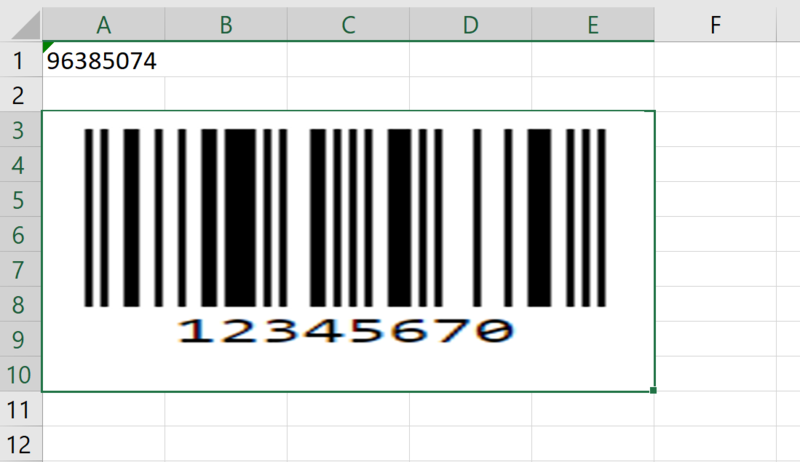 Two new widgets in version 9.4 let you generate barcodes and QR codes directly on your web page, either from static content or calculated by formulas and live data in a web form. We made it possible to report conversion errors and ask questions directly from the Errors tab in the task pane. We added more free example spreadsheets to make it easier for you to test the converter directly. We make 16,363 happy customers more successful. Learn more - or try it for free! Design your online calculator in Microsoft Excel, then convert it into a calculating and interactive web page. A smart calculator on your website makes people come back. With SpreadsheetConverter, you can publish nearly all Excel spreadsheets on the web, retaining the live user experience and the immediate recalculation when cell contents are changed. Test the program in your own Windows laptop with your own spreadsheets for up to 30 days at no charge. If you like it, buy a license key and your trial version is upgraded to the full version. The interactive charts can be manipulated directly by your website visitors. This increases the value of any chart, and involves your visitors in the analytical process. Click on a data series to show or hide the series. Hover the mouse over any data series to see it better. Use your fingers on phones and tablets. SpreadsheetConverter supports industry-standard responsive web design. If you split your spreadsheet into logical blocks, your calculators and forms look great on any kind of device. With other solutions you may have to create a separate “mobile” version of each “classic” spreadsheet. With SpreadsheetConverter you just divide the spreadsheet into responsive blocks that adapt to any screen width. With our Publish to Cloud service, your calculator is hosted on the distributed Amazon S3 infrastructure with superior performance, extreme reliability and massive scalability. Over a dozen server locations around the globe ensure that your calculator always is within easy reach of your global audience. Test versions are automatically deleted after 7 days. Production links never expire. 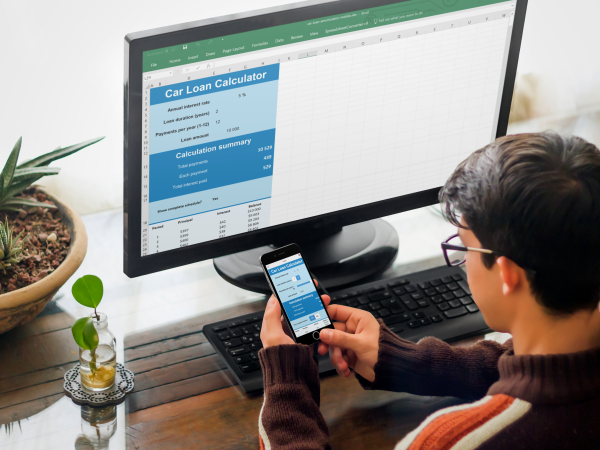 This developer is using Excel to create a calculator for a loan application form, and previewing the form on an iPhone. You only need basic Excel skills to develop powerful web apps. Everything works just like in Excel. Use formulas and functions to calculate values, and design the layout with Excel’s formatting options. Everything you do in Excel comes across to the web app. The screenshot is from a mobile web app that was directly converted from an Excel spreadsheet. 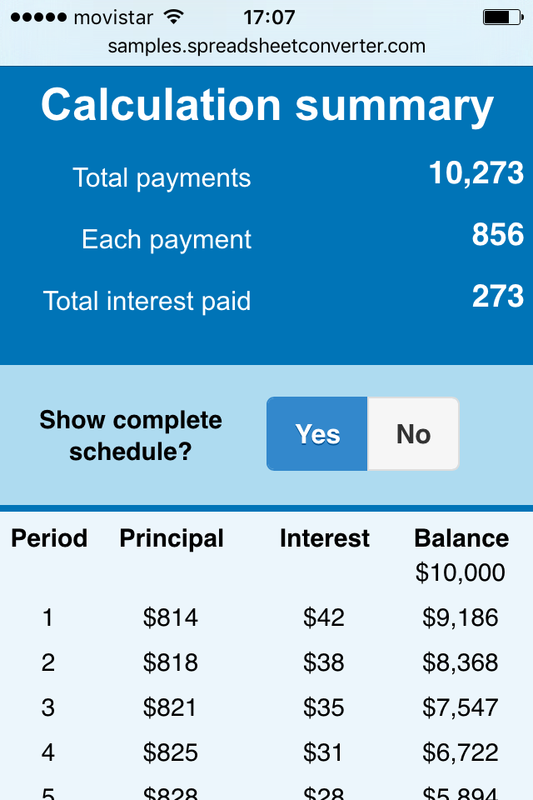 The app calculates the monthly payments for a car loan depending on time and interest. It also shows you the total interest paid for the loan. For us, it also demonstrates some of our popular web widgets and the powerful hide rows feature. To test the Car Loan calculator in your phone, scan the QR code below. If you’re uncomfortable doing that, read our tutorial about scanning QR codes. 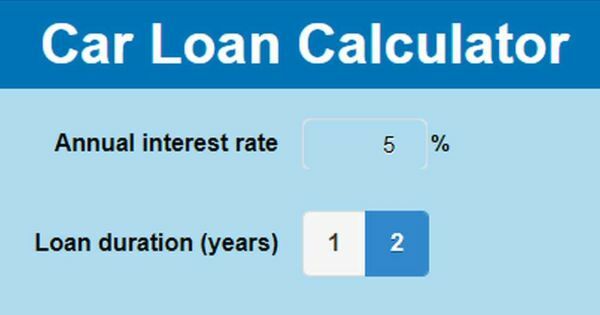 Click here to test the Car Loan calculator now. If you want to build apps like this just by converting Excel spreadsheets, read the guide to creating iPhone/Android web apps from Excel spreadsheets. Historically, most spreadsheets were made very wide to fit the desktop screens of long ago. Today, this landscape-oriented design makes old spreadsheets difficult to use on smaller devices that are mostly used with the screen in portrait orientation. The unnecessarily wide layout requires a lot of horizontal scrolling. 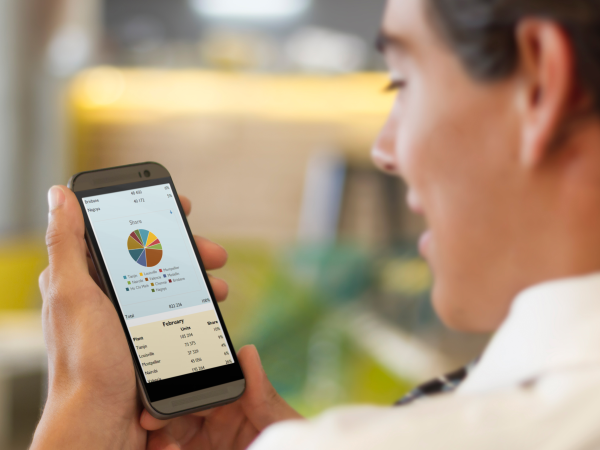 Other solutions may force you to create a separate “mobile” version of each spreadsheet. With SpreadsheetConverter you can instead easily divide the spreadsheet into responsive blocks that naturally flow across the screen to fit any screen width. With responsive design, your web calculator or form automatically adapts to different screen widths. A visitor with a wide screen sees the responsive blocks for January, February and March in the same horizontal row. On a tablet, the calculator automatically shrinks to a two-column layout. The March block appears below the January and February blocks. On a phone, there is only room for a single block at a time on the narrow screen. The February block comes after the January block, before the March block. Responsive blocks are easy to use and with little effort make almost any old and wide spreadsheet fit even the smallest screens.